If you’ve never had a really good German Potato Salad, you might think you might think you don’t care for it. I know this to be true because I’ve tried, from time to time, grocery store deli German Potato Salad. It doesn’t compare to what you can make at home. Just a little tart from the vinegar, rich with bacon and absolutely delicious, home-made German Potato Salad will blow you away. It’s a great item to bring to a potluck when you want to bring something just a little bit unexpected. There’s no big worries about toting German Potato Salad along like you might have with anything made with mayo. Great warm or at room temperature, German Potato Salad can be a bit of a cheat when getting dinner on the table. No need to chill like you’d do with a standard potato salad. I had such a craving for German Potato Salad that I didn’t run to the store to get red potatoes and used the russets I had on hand. Russets absorb too much of the vinaigrette; it was fine when I served it, but then got a little dry, so I’d really recommend using the firmer red potatoes or another waxy type. I also recommend using the lesser amount of potatoes because I like the tart bacon vinaigrette to shine through a little more. The only pricey item in this recipe is the bacon – do watch for sales, especially during holiday weeks (and we have so many in the summer), stock up and freeze. Potatoes are never usually expensive but if you have a cool place to store pick them up on sale – but don’t store potatoes and onions together. Cook potatoes in salted simmering water, about 15 minutes until just done. Drain and add to a large bowl in layers, sprinkling each layer with salt and pepper and a total of two of the tablespoons vinegar. Add the beef broth, bring to a boil and remove from heat. Add the remaining two tablespoons vinegar and bacon, taste for salt and pepper, and add a pinch of sugar if desired. Drizzle over potatoes and gently toss. Garnish with parsley or green onion. Serve warm or at room temperature. I’ll be bringing this recipe to Fiesta Friday, hosted this week by Monika @ Everyday Healthy Recipes and Jhuls @ The Not So Creative Cook. This entry was posted in Click here for Fabulous Food Posts and tagged Bacon, Frugal Hausfrau, German, Green Onion, hearty sides, potato salad, Potatoes, Side, Vegetable Side, Vinegar. Bookmark the permalink. Oh this used to be my favourite side dish during my stay in Germany!! They make it so different in Berlin and I loved your version served in southern cities. Great recipe. Hi, and thanks! It’s been so much fun to hear about the differences in the potato salads in the regions of Germany and that has led me to surmise how our regular old mayo based/pickle relish tomato salad came to be, too. This is my favourite variant of potato salad also (though always with added chopped gherkins and their pickling fluid instead of vinegar). I have to say that there are lots of different variants of German Potato Salad, though! In my region, it’s normally made with onions, gherkins, cubed bologna and mayonnaise. (I find it completely unattractive). Often, tinned peas are added. (They don’t make it better.) Other regions use only gherkins and mayo. My grandmother’s place of origin, on the other hand, does potato salad with broth, vinegar and chives. In general, Northern Germany seems to love ladling on mayo, while Southern Germany prefers vinegar. But Austria, even further south, apparenty uses mayo again. That’s all so cool for me to hear about! I think I would love gherkins, but not peas! I can see that I’v e only scraped the top of potato salad possibilities! The gherkins are quite nice – they add a nice acidic lift, I think. The peas serve no purpose at all (in my opinion, of course). I’m not a fan of canned peas anyway, though! A lot of our American recipes use pickle relish – probably a spin off of the original gherkin. That makes sense! The effect would be the same. No wonder my potatoes are always sprouting! I store them next to the onions, oops! But then I can toss them in the garden and get more potatoes 🤔 I’d better make this today before all my potatoes start sprouting! Well, homemade is always the best! I love the addition of beef broth! This potato salad sounds fantastic! Thanks for bringing another lovely dish at this week’s FF party! Hey, if you know anything about the Rouladen, I’d love to know. It seems to be a lot different than any Rouladen I’ve ever gotten at German restaurants or seen in cookbooks. The northern version sounds like our American Style potato salad!! 🙂 Maybe that’s where it came from! Thanks Chef! It’s always fun to try a few new recipes now and then, isn’t it? Or like I often do, “steal” a little from this recipe and that one! Oh my lanta, this looks so yummmm. I didn’t know there was such thing as German potato salad (I always just knew the traditional time!). This looks super scrumptious. I bet this would be a perfect side for the 4th coming up! OK Mollie, you’re making me hungry– Do you grill the onions?? Add them to the beer? I think your potato salad will be perfect!! thanks! Love this combination. 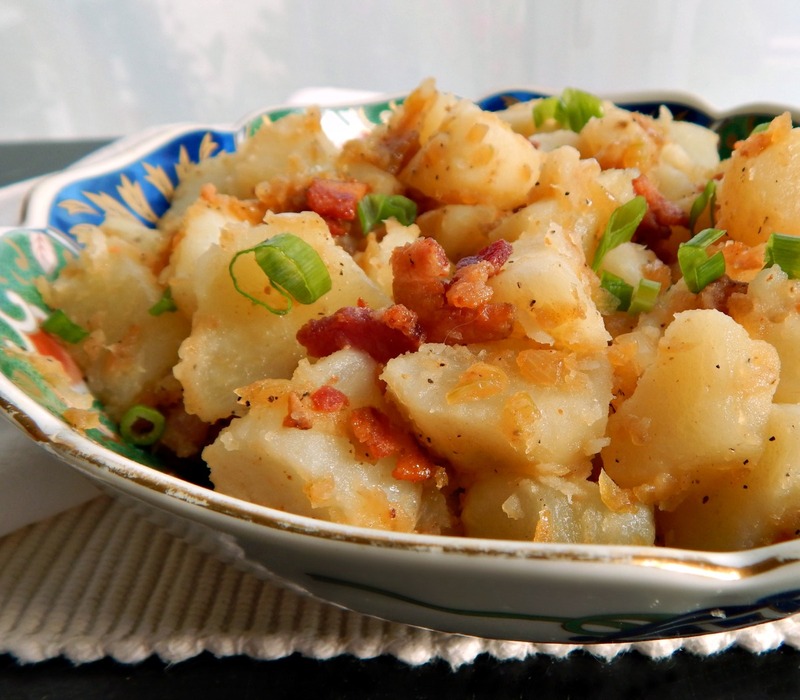 Potato and bacon – delicious. And great dressing. Will have to try. I prefer vinegar based potato salads to the american version full of mayo! Thanks for sharing this recipe! After seeing some of the comments here, I realized my Mom’s potato salad (mayo)and my Grandma’s (bacon and drippings) and mine (olive oil& vinegar) only begin to scratch the surface! As a German by birth how can I not like German potato salad? I do, of course. But to get bacon here is impossible, so I have to cheat and use chicken “frankfurters”, which I can find in our Hypermarket. But to have this from a shop/deli – impossible. You are of course aware of the fact that nearly every German family has their own recipe?😁 Thanks for posting this. Made me hungry. I’ve only ever had from a restaurant and deli and didn’t like it. I do love how yours sounds and it looks so delicious!! I think they make the vinaigrette with flour so it holds up when it sits. I’m not sure…I just know it’s weird!! lol! So thanks, Suzanne!